It looks great, I love how the butterfly is off centered. I would love to see the color added. What is the significance of butterfly combined with tiger? knitstuff, I LOVE THAT. really. i do. knitstuff- Your tattoo is terrific. I really like its simplicity. Wow, I love everyone's tattoos! They are all incredible. Here is mine, on my left shoulderblade, about the size of a fist. I love it. It's only a few months old and the picture just doesn't do it justice. It was my 17th birthday present from my mom (yes, it's legal in Ohio). that's sooo cool. 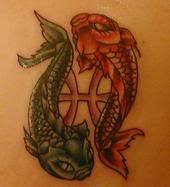 i'm planning on my first tattoo being a Pisces tattoo too. My tattoo artist suggested a great Pisces design to a customer one night...it the cd art from an Incubus album. The customer loved the design and wanted it in the same orange and yellow hues as the cd. I saw a pic of the finished work a few weeks later. It was awesome! my best friend's boyfriend had it done in black, and it still looks good, but he doesn't really like it anymore because it's recognized as a "band tattoo," not as fish/pisces.